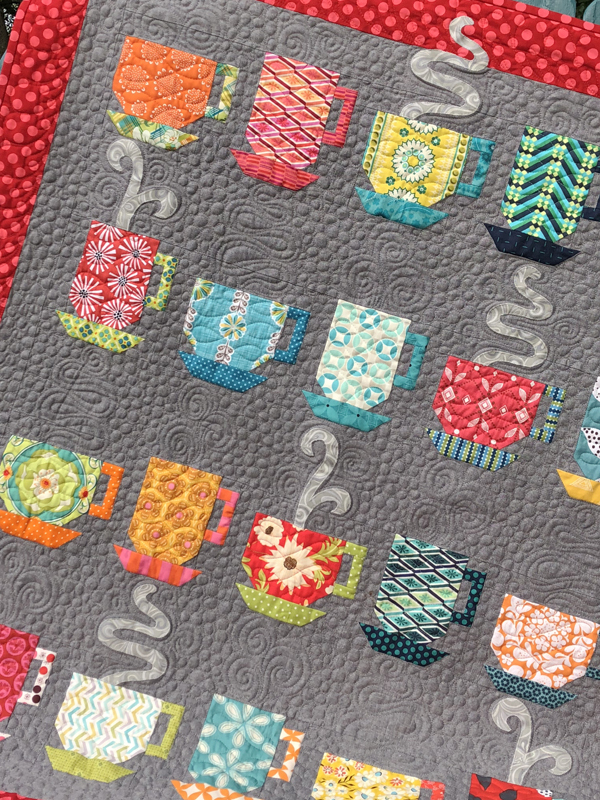 It's the newest Quiltmaker's 100 Blocks! Time sure flies by quickly. It seems like just yesterday I was sewing up my block for the 100 blocks vol.2. 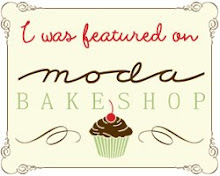 At the time, I was making my Freebird quilt "Chocolate Stars" for Moda Bakeshop. I carefully selected the colors to accent the block, from the Freebird scraps. I love this block and it was really hard to send it away. Now that you know which block is mine, do you spy it on the cover? When I received the cover art work, I blinked and double blinked. Was my block one chosen for the cover? Would you like a copy of 100 blocks? 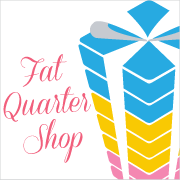 Quiltmaker is sponsoring the gift of a copy of the magazine to one of my readers. I have an additonal magazine to giveaway. Comment on this post TODAY ONLY for a chance to win. 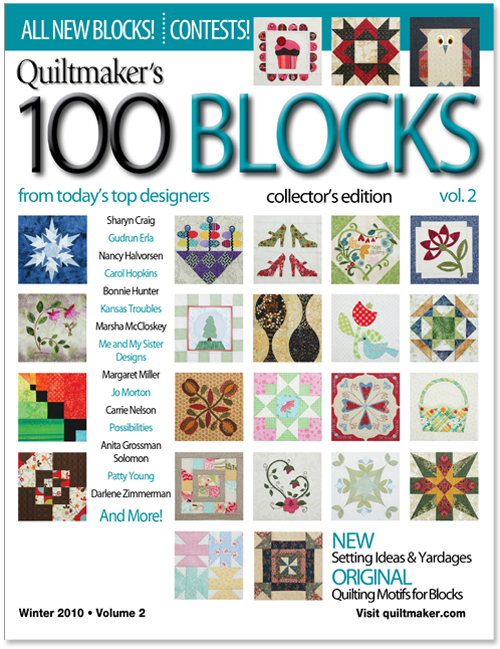 Up for grabs: 2 a copies of Quiltmaker's 100 Blocks vol. 2. Contest ends 11/13/10 at midnight EST. 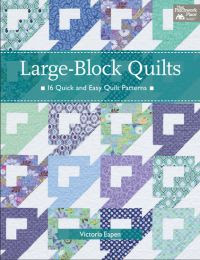 To find out more about other contributors to 100 Blocks check out Quiltmaker's blog. congrats on making the cover. It's a lovely block. This block is brilliant! My favorite so far! Who-hoo! Not only a winning block, but on the cover, too. Congratulations, Vickie! Congratulations on a cover deserving block Vickie! I love your block! Thanks for offering this giveaway. Would love to win - thanks!! I like your block Vickie. So nice of you to give away this magazine, I would love a chance to win a copy. How exciting to be on the cover! I love your fabric choices! This block really pops!!! Congrats on making the cover! I love your block Vickie! Congrats on being published in the magazine, I love your block!! I hope I am lucky enough to get my hands on a copy of this magazine, it looks fantastic!! Congratulations the block is fab! Congrats for having a block in the book AND making the cover! Love how graphic your fabric choices made the block. . . .
Congratulations for having a block on the cover, Vickie! I'd love to have a copy of this magazine. congratulations on the cover! i've won this magazine already, so this comment isn't an entry, I just wanted to say congrats! and that i love your block! Congrats on making the cover. How exciting!! I love the Momo fabrics you used. Congrats on being feature & making it to the cover - It is a lovely block! Wow, to be on the book cover! Congrats! I've been practicing my rottary cutting and piecing skills. This book would be a great tool! Thanks for the generous giveaway! Congratulations on making the cover! Great block and one of my favourite fabric lines! I Love your block.Fantastic colours. Congratulations! Congratulations! And on the front cover! That's fun! Great block! I would love to win a magazine! Congratulations on your block making the cover! oh, I'd love to win that book! it looks so good! I love your block and your blog. I would love to use this block to make a scrap quilt. I really need to use up some of my scraps. And I will be back to visit your blog. Congrats, Cover Girl!!! Love the block! And I would love a copy of the mag! I LOVE that block, and I'd love to win the magazine. Lovely block - the chocolates are so rich! I love your block - congrats on makeing the cover too! thanks for the giveaway! I love the block, and I'd love to win the magazine. Love your block! This is one that I can see me actually making. Thanks for sharing with us! Wow! Nice to be on the cover. I'd love to win that book. I love your block, it has such good geometry. And could work with so many types of fabric. Thanks for the chance to win. Yay! Congrats on getting your block to the cover! I'd love a copy of that magazine...so here's keeping my fingers crossed! How fun for you! Love the complex look of the blocks.I so have to try this out! I'd love to win! Congratulations on making the cover. Of course just being in the magazine is cool!!! I'd love to have the magazine. Super block ... EXCELLENT name! Congrats on being on the cover, and thanks for the fun hop and awesome giveaway ! How exciting ! ! ! I really like your block! Congratulations on making the cover. Can't wait for the magazine! love your block, i can honestly say, it is one of my favorites i have seen so far, and as your's is the last, that is pretty awesome!! love the colors, they are so pretty!! thanks vickie, and congratulations on all your successes!!! Wow! A cover girl, huh? Great block. This one is on my list to try. Thanks for the chance to win a magazine. WOW so cool for you. Congrats!!! I love the brown in your block. Thanks for the beautiful block, cover girl! I love the fabrics! Leave a comment on my blog if I win! Great block for the magazine. Also, I spied the very cool new mixwe on the last post. Double congrats!! Great block! I'd love to win a copy of this magazine. Thanks for the chance. On the cover! Awesome! Very cool looking block, Vickie! Love your block! And so cool that you made the cover. I love your block...the browns are great! Thanks for the opportunity to win a copy of the magazine! I love your block. Great fabric selection. Congrats on making the cover of the magazine. Congratulations on the cover shot! What a fabulous block! I particularly love the colors - and would love a chance to win this magazine! Thanks for the chance!! Congratulations on being published on the cover! Beautiful block. This is a great block. Congratulations on being in Volume 2 AND on the cover! Love this quilt block and the colors of the fabric. Thanks for the giveaway. Wow a cover block! Congrats! Congratulations! And such a great block. Would I like to try for a copy of the magazine so I can make my own version of your bloc? You betcha! Thanks! This is a great block. One you could use all types of fabrics. congrats on the cover. the range of blocks looks amazing. Congratulations on being a cover girl :-) Great block! Great block. Congrats. thanks for a chance to win a magazine. Congratulations on your cover block. Thanks for the giveaway! I really like your block. Congratulations on making the cover. Thanks for the giveaway. That's so cool that your block is on the cover! It sort of reminds me of two butterflies intertwined (is that a word?) Would love to win - thanks! Ohhh mmmmm geee... how cool to have your block on the cover!! Congratulations! I just played with a bitty pic in Punisher and the block is lots of fun! Looking forward to playing with it in actual fabric. Love your style! I am eagerly awaiting my chance to see the magazine. I love your block! How fun to have it land on the cover of the magaizine!!!!!! Yeah! Infinity is a cool name. When you stare at the center of the block it has a sort of mesmerizing effect. Congratulations on being selected for the magazine. i can see why it would be hard to give up. hopefully you made a second one just like it. congratulations on making the cover. Congrats on making the cover! I love the block! I've seen this magazine all over the web lately. Congrats on making the cover! Beautiful block and the colors are perfect! Congrats on making the cover. Your block is just perfect: complicated looking but not crazily difficult! I'd love a copy of this magazine! Your block is just great, can't wait to give it a try. thanks for the giveaway. Congrats on making the cover, its such a unique block, I am excited to see it next to its twins! Congratulations on your cover winning block! Congrats on your cover block! Wow, the cover! How special. Thank you for the chance to win. Your block is great! I love this block, and I would love to win the magazine! :) I have volume 1, and I can't wait to get my hands on volume 2! Thanks for the giveaway! Congratulations on making the cover of QM 100 blocks! I've been stopping by to read your blog for a while. Your entry block is lovely. Thank you for the nice giveaway - please enter my name into the drawing. Love the block and would love a copy! Congratulations on your block being in the magazine and especially on the cover! Pick me for a free magazine! Love your choice of fabrics. Looking forward to playing with this block to see the secondary patterns that happen. Would love to win. I love the block and the fabric. Congratulations on being on the cover! This magazine looks like it would be great addition to quilting libraries. Thank you! Congrats on the cover! That's wonderful! Congrats on the cover! Love your block! Thanks for the great giveaway. I love your block! Very cool. I went through your list of the quilters who have entered and I couldn't find my name so I don't think I have entered...yes the mind is sharp as a tack...albeit a VERY rusty tack!! Please throw my name into your GA hat!! I would love to win this magazine! Thanks SEW much!! Would love to win . very nice block!!! congrats for making the cover! Congratulations on being a cover block! It is a fabulous block! Hi Vickie! 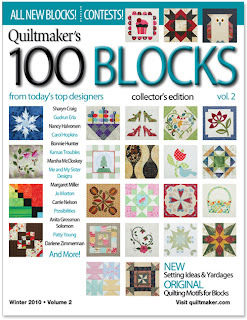 Congrats on being chosen for the cover of Quiltmaker's 100 Blocks Magazine!!! Your Infinity Block is really cute and I can imagine lots of possibilites for quilts! Thanks for the chance to win!!! Congratulations on the cover photo! Love the name of your block! Thanks for the fun giveaway! great block! thanks for the opportunity to win a copy. Great block and on the cover how wonderful. I love your block! Crossing my fingers to win. Very cool block! Congrats on making the 100 block issue! What a pretty block! I love the fabrics too! Congratulations on making the cover... Infinity so appropriate. Many more will come. I'd love to win a copy of this mag. Congrats on your cover art!! What a neat block - it's lovely! What a great block! I can see all sorts of possibilites for it.....And yes, please enter me into the drawing for a copy of the magazine! Congrats on the feature in 100 Blocks! And the cover at that! Double the whoo hoo! What a great block! Congrats for making the cover. I love your blog and read it daily. Keep up the good work! That black really enhances the other fabrics. Thanks for the giveaways. Congratulations on making it to the cover. I think it would be awesome to be selected as a designer for the publication but certainly icing on the cake to be one of the 100 selected for it's cover! When hearing the blocks name I automatically thought of the movie Toy Story. Infinity and Beyond! OOHhhh - I love this block! This one will absolutely go on my TO DO list!! near the TOP! Found it last block in far left row!! Congrats to you. Congrats on being featured - and 'Infinity' - indeed! Interesting block! thanks for the chance to win a copy of 100 Blocks. Great block! And on the cover! Love the colors you used in your block - very chocolatey! Thanks for the chance to win the book. A cover girl! Congratulations!! It looks like a fabulous publication! How exciting to be on the cover! Great block! How fun it must be to see your design work on the cover of this most amazing magazine! I like your contemporary block! I can't wait to own a copy of this second edition of 100 Blocks. LOVE your block....especially in Freebird.....thanks! Great block--love your color choices! Love your block! Congrats on the cover! Thats great news! Keep up the inspiring ideas! I'd love to win this magazine. Your block is great. Congrats on making the cover! How nice that you made the cover of the new issue!! I would love to win a copy. I really enjoyed last year's issue. Congratulations on not only being in the magazine, but on the cover too! Great block! ♥ your block! Keep rockin' it, sister!! Love the chocolate brown fabric. Wish me luck!! Congratulations on making the cover, Infinity is gorgeous! love the colour and fabric choice. Love your block. The fabric you used is great too. Congratulations on being on the cover too. Looove those fabrics, and it's a great block for those fun fabrics! Congratulations!!! And I want to win a magazine! Way cool block! I'm going to have to make a quilt out of it...I'll send you a pic. Thanks for the gift opportunity too. How exciting that your block is on the cover! This has been a fun week checking out the different blogs and websites. Thanks for the giveaways. What a lovely block! I've got my fingers crossed that I win! I really like your block & will have to try it out. Congrats on being on the cover. Congrats for making the cover. Thanks for the wonderful block and for taking part in this fun event. Congrats on making the cover! Thanks for the chance to win! Nice block! Congratulations on making the cover of the magazine. I am looking forward to seeing your block and the 99 others in this magazine. How fun to have yours on the cover!! What a lovely block. Love your color combinations. Love, love, love your block!!!! Cool block! Looks easy to do too. Not too many triangles, either! :) I could probably make this one! What a treat! Congratulations on your block making the front cover!! Beautiful! What a great block. I can see it in so many color combinations. And I would love to win: what inspiration to hold and use. Congratulations! I love those chocolaty browns in your block. That is a great block, and love the color combination. Congratulations for making the cover! Congratulations on making the cover. I love the chocolate in your block.It looks great. Sure would like to get this special magazine as a prize! Congratulations on being in it...and on the cover! I love your block! And I REALLY love that gorgeous chocolate brown fabric you used with the floral print...yummy! Congratulations on a block in the book and on the outside of the book! Wonderful block and I'd love to win the giveaway. A wonderful block- Congratulations on being chosen for the magazine. Congratulations on being on the cover too. I love your block! The best part is it coordinates with your new Kitchen Aide! lol I'm new to your blog and that is one of the big "pluses" of this 100 Block V2 venture! Congratulations! I really like the fabric choices for your block. Congrats on being selected for the cover. Your block is very nice and so well named! I would love to win the magazine. Great block. Thanks for the chance to win. What a cute block. I could totally see myself making it, Vickie. Congrats on making the cover, very big stuff. You are just making a splash all over the publishing world, good for you! Wow, what an honor! Congrats for making a lovely block! Thanks for the chance to win. Ooh I really love your block. Great name for that too. I really like how the center of that block looks. I can certainly see why you gave it the name you did. Congratulations for being in the magazine AND on the cover too. YAY. How fun. Your fabric choices are great. Thank you for the giveaway. From here to Infinity! And beyond! Congrats on making the book!